Frequently Asked Questions – Tekno RC, LLC. We are always looking for new talented and helpful representatives to further promote our company’s positive image. If you think you are a good fit for our brand and are the kind of person that is helpful to others at your local track, please complete our team application form. If you receive a defective part in a kit or parts order please contact us or call us at (858) 997-0833 before attempting to modify it. If the part shows any signs of being modified or used prior to contacting us then the manufacturing defect warranty will be Void. We will do our best to assist you in a timely manner and get a replacement sent out ASAP. What are the servo requirements for each vehicle? We suggest a minimum of 250oz/in of torque for the SCT410, EB48 and NB48 and a minimum of 300oz/in of torque for the ET48 and NT48. What is the pin size for the Outdrives TKR5112, TKR5112X, TKR5114, TKR5114X, TKR5614, and TKR5614X? We do not sell those parts separately however, they are common parts that can be easily found at most hobby shops or online hobby shops. The correct pin size for TKR5112, TKR5112X, TKR5114, TKR5114x, TKR5614, and TKR5614X is a 2.5x10mm pin or part number SER110213. 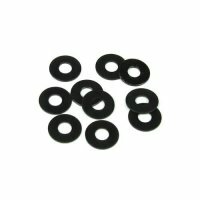 What are the pin sizes for TKR5071, TKR5071B, TKR5071C, and TKR5071X? We do not sell those parts separately however, they are common parts that can be easily found at most hobby shops or online hobby shops. The pin size for TKR5071 is a 3 X 17MM and the part number from HPI is HPI101082. The pin size for TKR5071B, TKR5071C, and TKR5071X is a 3 X 13MM and the part number from Serpent is SER110210. If you are having an issue where the cart items are being added or removed from your cart without your input, please write down your cart contents, clear your browser cache then log into your account. If you are experiencing issues related to the website and you have already tried clearing your cache, please use our contact form and select Website Issue to tell us about it. We would like to hear about the issue and help. What is the dimensions of the receiver battery box? The receiver battery box dimensions are 36mm X 59mm X 34mm. What starter boxes work best with your vehicles? Almost any starter box can be adapted to work with our vehicles, however we feel that the best compliment to our vehicles is the Ofna truggy starter box (Ofna part number: OFN10244), due to it's power and size. 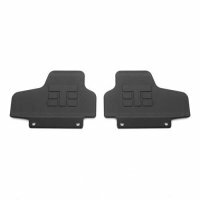 What is the difference between the forward and rearward engine mounting positions? The forward engine mounting position allows for more corner speed and better steering response. The rearward engine mounting position allows for more general and on-power traction as well as increased steering entering a corner. What offset wheels does the SCT410 use? The Tekno SCT410 uses the same offset as the Losi SCTE and is still ROAR legal. It will also work with the Team Associated SC10 4X4 which are a little wider. What body fits the SCT410? Any body for the Team Associated, Losi, and Slash 4×4 will fit the Tekno SCT410 with minor changes to the body hole locations. The only direct fit body is the Losi SCTE body and it come pre-cut and the body post holes already reamed out. What parts are needed to convert the SCT410 into a super light EB48SL? (2x) TKR5570-17 - 17mm buggy width adapters Hardware includes - (4x) TKR1201, (2x) TKR1220, (2x) TKR1221, (1x) TKR1323, (2x) TKR1325, (4x) TKR1401, (1x) TKR1522, (8x) TKR1524, (2x) TKR1525, (5x) TKR1529. I converted my SCT410 to a EB48 super light, what parts do I need to make it even lighter? 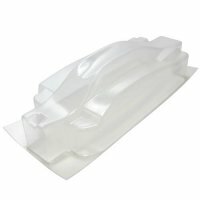 If you are looking to make your EB48 SL even lighter, then there are other modifications that can be made. By adding the following parts, you can remove substantial weight. These items and others can be found in the SCT410 and EB48SL Option Parts section. 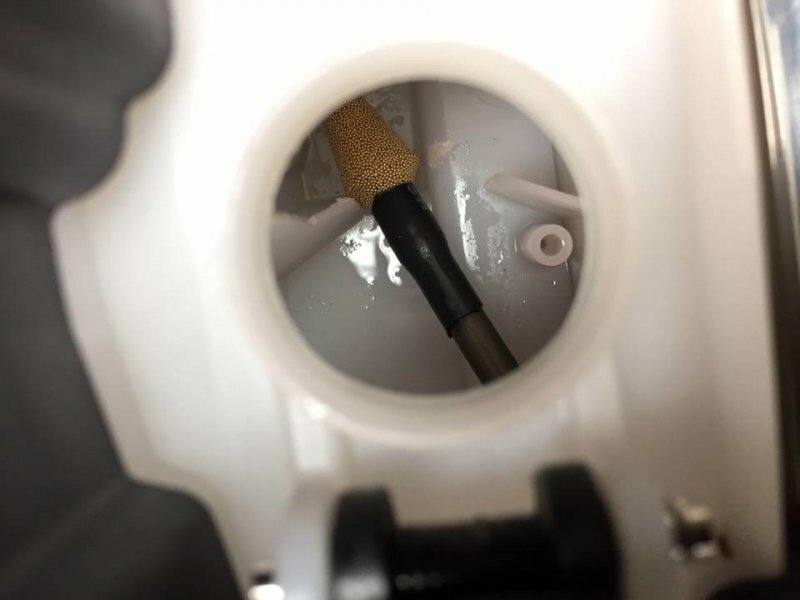 You can also replace some of the screws in the kit with aluminum counterparts or trim the mud guards down in certain non-crucial areas to even further reduce the weight! What are the best upgrades to add to my SCT410? Right out of the box, the SCT410 is highly competitive and outfitted with many great option parts. Some of the most common upgrades first time buyers purchase are Aluminum Wheel Hexes (TKR5571A or TKR1654X), Aluminum Center Driveshaft (TKR5577), Aluminum Servo Horn (TKR5251, TKR5252 & TKR5253), Aluminum Hinge Pin Braces (TKR5013 & TKR5017) and Air Control Guards (TKR5504). What is the pin size of 5571A? We do not sell that part separately however, it is a common part that can be easily found at most hobby shops or online hobby shops. 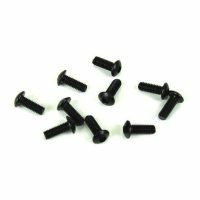 The correct pin size for TKR5571A is a 2 X 10MM or a HPI part number of HPIZ264. What is the pin size for TKR5570-17? We do not sell that part separately however, it is a common part that can be easily found at most hobby shops or online hobby shops. 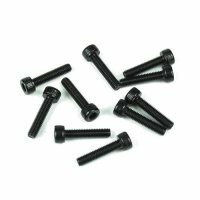 The correct pin size for TKR5570-17 is a 2.5 X 12MM or a HPI part number of HPIZ260. What is the pin size for TKR5571-17? We do not sell that part separately however, it is a common part that can be easily found at most hobby shops or online hobby shops. 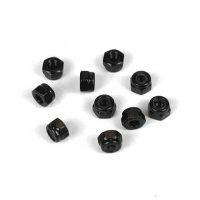 The correct pin size for TKR5571-17 is a 2 X 14MM or a Serpent part number of SER110219. What are the battery tray dimensions? 148mm X 50mm. Most common 2 cell LiPo packs fit fine. What parts are needed to convert the EB48SL to an SCT410.3? You will also need some random hardware to put the parts above together. Please refer the the SCT410.3 manual HERE: for reference on those. Also if you want to run the nerf bars (L/R side bumpers - not required) then you will also need TKR5510 and TKR5511 as well as the nerf bars TKR5502. What other bodies fit the EB48? Currently there are three other body options besides our own for the EB48. Pro-Line makes the Phantom body (Pro-Line product ID# 3432-00), JConcepts also makes a body called the "Finnisher" (JConcepts part number JCO0262) and FTW makes the Exabyte body (FTW part number: FTW00052). What option parts do you recommend for the EB48.2? The most common options we recommend to people are: An aluminum servo horn the part numbers vary with spline count, TKR 5013C the LRC rear toe block, and shock pistons and springs to suit your track. All of these parts can be found in the option section under the EB48.2 parts list on our webstore. What Motor should I purchase for my ET48? Tekin 1900 Buggy motor geared with a 15 tooth pinion. Tekin 2050 Buggy motor geared with a 14 tooth pinion. Tekin 2000 Truggy motor geared with a 15 tooth pinion. What is the hex pin size for TKR1654 and TKR1654x? We do not sell those parts separately however, they are common parts that can be easily found at most hobby shops or online hobby shops. The correct pin size for TKR1654 and TKR1654X is a 2x10mm pin or HPI part number HPIZ264. 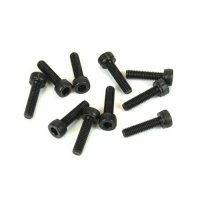 I have lost the set screw pin for the differential outdrives (TKR6828X) do you offer a replacement? We don't actually carry that part because it's a stock component (TRA6828x). It should be available to order online or found at a local hobby shop near you. 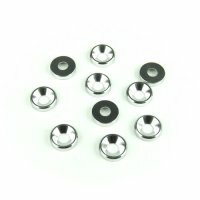 What is the pin and set screw size for the 17mm adapters (TKR1654-17)? We do not sell those parts separately however, they are common parts that can be easily found at most hobby shops or online hobby shops. 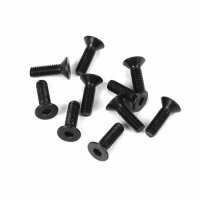 The setscrew is an M4x4mm and the pin is a 2.5x12mm. The pin is also the same Traxxas PN: 4955. What is the replacement shim size for TKR1654X, TKR5571A, TKR1951X, TKR6851X & TKR6852X? The correct replacement shim size is 6x10x0.2mm. 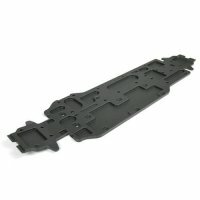 Tekno RC part number TKR1229. I’m interested in your Slash 2WD axle upgrade kit but I really like my aluminum carriers. Do I have to run your plastic pieces or can I keep my aluminum ones? 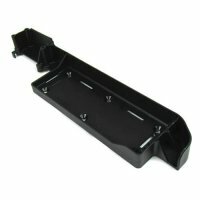 For our Slash 2WD kit you will have to run our plastic carriers. There are currently no aluminum carriers that will fit our axles. Because we increased the diameter of the stub axle and captured the CVA we needed to uses larger bearings that simply will not fit in any other carrier. We designed the carriers to be super beefy and they have proven to be nearly indestructible. We designed them to be tunable, allowing for multiple roll center options with the camber link as well as the outer hinge pin. Our thoughts were that if plastic is good enough for 8th scale off-road, it can handle duties in a Slash. I’m interested in your Slash 4WD axle upgrade kits but I really like my aluminum carriers and steering blocks. Do I have to run your plastic pieces or can I keep my aluminum ones? 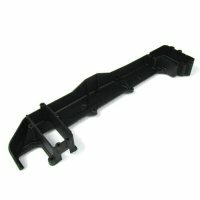 For our rear axle kit you will have to run our plastic carriers. There are currently no aluminum carriers that will fit our axles. Because we increased the diameter of the stub axle and captured the CVA we needed to uses larger bearings that simply will not fit in any other carrier. We designed the carriers to be super strong and they have proven to be nearly indestructible. We designed them to be tunable, allowing for multiple roll center options with the camber link as well as the outer hinge pin. Our thoughts were that if plastic is good enough for 8th scale off-road, it can handle duties in a Slash. For our front axle kit you do have some options if you wish to run aluminum steering blocks. If you’re currently running aluminum what you’ll need to do is purchase a 6×11 bearing and use it in place of our 6x12mm bearing. 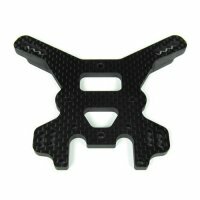 The other option you have is to use the steering blocks from the Traxxas X-01. They are a direct replacement for ours. They fit our bearings and axles without any mods. 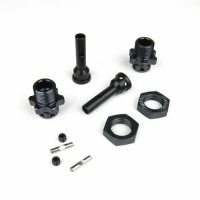 Do you sell an M6 driveshaft kit that is compatible with the Electric Rustler/Stampede? At this time we don’t have a kit solely for the 2WD Electric Rustler/Stampede, But you can purchase these parts below and make the 2WD Slash nitro Rustler/Stampede kit work for the electric counterpart. You will need TKR1951X and TKR2210 for the Electric Rustler/Stampede. The TKR2210 replaces the CVD’s in the 1951X kit to make the kit fit on the electric Rustler/Stampede. The 2210 CVD is a little longer than the 1951X CVD which is needed to fit the electric Rustler/Stampede. Do you offer M6 axles for the Slash 2WD with ProTrac arms? At this time we don’t have a kit solely for the 2WD Electric Slash with Protrac arms, But you can purchase these parts below and make the 2WD Slash kit work for the Protrac equipped counterpart. You will need TKR1951X and TKR2210 for the Electric 2wd slash with Protrac arms. The TKR2210 replaces the CVD’s in the 1951X kit to make the kit fit on the Protrac equipped 2wd Slash. The 2210 CVD is a little longer than the 1951X CVD which is needed to fit the Protrac's longer arms for 2wd electric Slash. I’m interested in your Stampede 4WD axle upgrade kits but I really like my aluminum carriers and steering blocks. Do I have to run your plastic pieces or can I keep my aluminum ones? 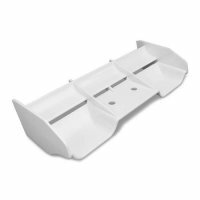 For our rear axle kit you will have to run our plastic carriers. There are currently no aluminum carriers that will fit our axles. Because we increased the diameter of the stub axle and captured the CVA we needed to uses larger bearings that simply will not fit in any other carrier. We designed the carriers to be super beefy and they have proven to be nearly indestructible. 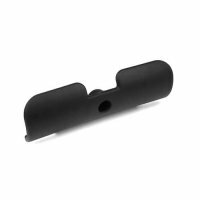 We designed them to be tunable, allowing for multiple roll center options with the camber link as well as the outer hinge pin. Our thoughts were that if plastic is good enough for 8th scale off-road, it can handle duties in a Slash. For our front axle kit you do have some options if you wish to run aluminum steering blocks. If you’re currently running aluminum what you’ll need to do is purchase a 6×11 bearing and use it in place of our 6x12mm bearing. 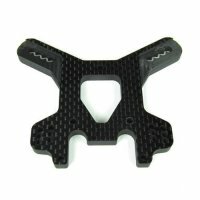 The other option you have is to use the steering blocks from the Traxxas X-01. They are a direct replacement for ours. They fit our bearings and axles without any mods. What bodies fit the V4 conversion kits? The most popular body for the V4 chassis’ would be the Losi eight 2.0 E body. With Velcro on the mud guards and on the body we have had great success with that body. It requires minimal trimming to fit any of the V4 conversions and still allows the use of body clips as well as Velcro if desired. The Losi part number is LOSA8097. Another choice is the FTW. They produce a couple of bodies for our V4 chassis’ including the Mugen MBX6, Hotbodies D8 and Losi 8E 2.0. 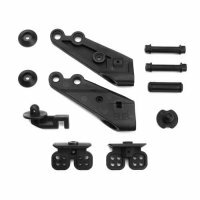 What rear chassis brace is needed for all V4 Truggy kits (except Losi)? What motors fit in the V4 42mm motor mount provided with the kit? The rear body mounts go on the tower pretty easily. You can turn the M4 nut around so as to still engage it with a nut driver. For the front, you can use an M4 hex spacer (10mm or 12mm long I think) in place of the nut, then put the body mount on the end of that, secured with a M4 BH screw, all to space the mount more rearward. You could mount the front mount directly on the tower and space the rear mount forward to achieve the same effect, just depends on how you want the cage to sit. Basically our chassis is about 10mm too long so the body mounts had to be moved closer together. You can also switch the rear suspension arms and hubs to the old SCT410 version to gain more wheel clearance and maintain a narrower overall width. To further improve upon this, you can run them in the short arm configuration, again for clearance. And since these hubs have 1 degree of toe built in it's best to run 1.5-2 degrees of toe at the inner pins. If you don't run these arms and hubs you'll have to run wider SLW hubs for the rear, 725 or 850. With these arms you should be able to run 600 hubs front and rear (using Vanquish wheels). SSD wheels have more offset built in so you should be able to use 475 hubs and still clear everything. For the PL wheels 600 hubs works. Anodizing colors on aluminum parts can vary between production runs. While we do our best to maintain and reproduce the same color with every batch of parts, we DO NOT guarantee a perfect match between parts. 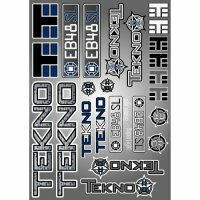 This in no way affects the performance of your Tekno RC kit, and is therefore not covered by our general warranty.